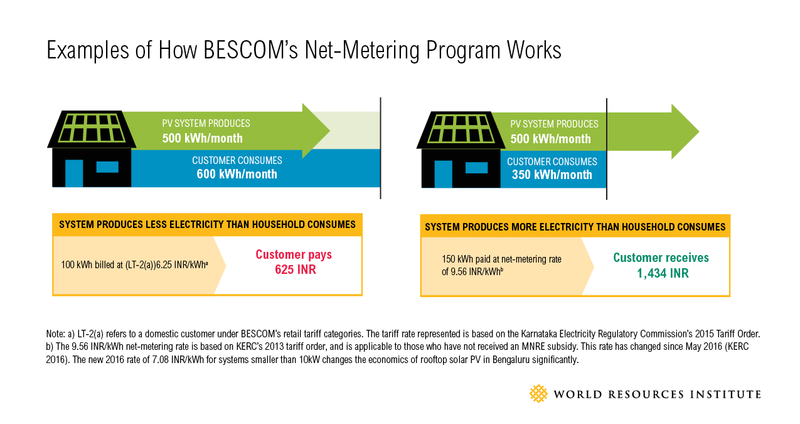 Under BESCOM’s net-metering tariff, owners of rooftop solar PV systems are paid a promotional rate of 9.56 INR per kWh for net excess generation provided to the grid on a monthly basis. This rate is only applicable to systems that do not received a capital subsidy from the Ministry of New and Renewable Energy. For systems that receive the subsidy, the rate is 7.20 INR per kWh. Net-metering customers with rooftop solar PV systems that do not provide net excess generation to the grid on a monthly basis are billed at the per kWh rate of their normal tariff for their electricity consumption minus any generation from their rooftop solar system. Please note that since the report was written, the promotional rate has changed to 7.08 INR/kWh for systems smaller than 10kW. This new rate, applicable to systems commissioned after May 2, 2016, changes the economics of rooftop solar PV in Bengaluru significantly.